My dear wife is gone on a vacation with her mother, so the cats and I are baching it. When I asked her what she wanted for her last meal on the Egg before she left, she said she had a craving for a big ol’ steak topped with bleu cheese. I decided to try a black ‘n’ bleu version using a nice pair of a dry-aged New York strips and my cast iron griddle. The black is the nicely charred black pepper crust and the bleu is the simple bleu cheese sauce on top. 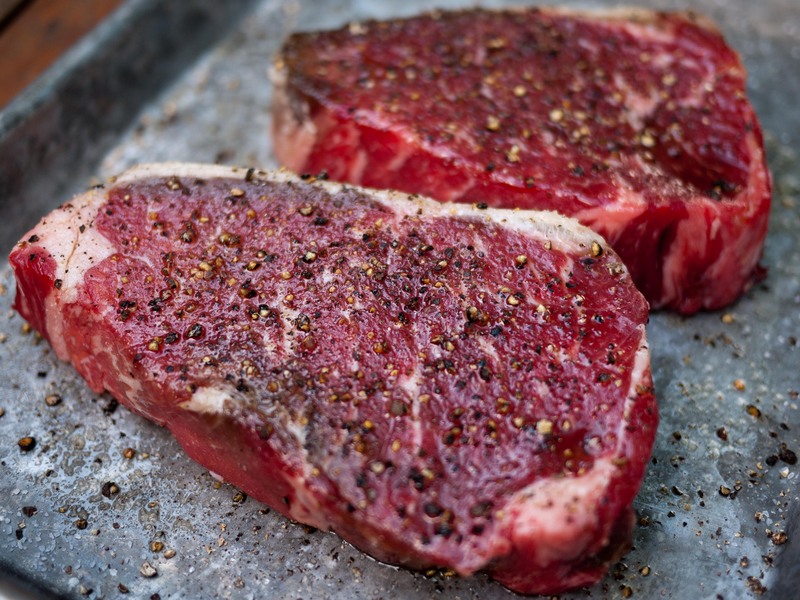 I drizzle both sides of the the steaks with olive oil and then seasoned them with a few grinds of salt and pepper. I let the steaks sit out at room temperature while I got the grill fired up and made the sauce. I set the Big Green Egg up for a direct cook at nuclear temps (700+°F). When the grill was roaring like a dragon, I put the griddle directly on the grate and let it heat up for about 15 minutes. I made the cheese sauce by working the cream into the crumbled cheese with a fork until everything is combined, but still a little chunky. I stuck it in the fridge to set up a little. Been wondering where the bungled part comes in? See that harmless looking griddle? I tossed the steaks on there for what was supposed to be 3 minutes per side. Hoping against hope, I pulled the steaks off and let them rest for 10 minutes. Then topped them each with a scoop of the bleu cheese sauce and served them with a salad, baked potato, and sauteed mushrooms. 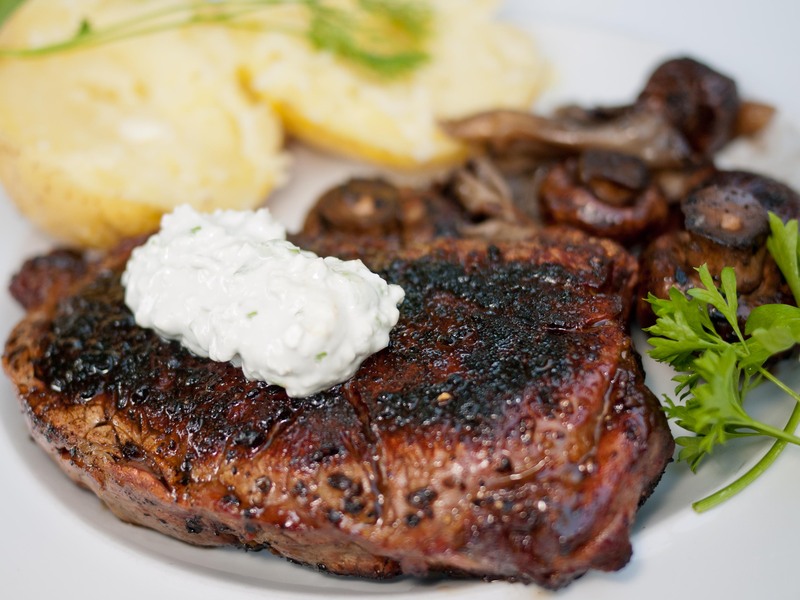 I feared the steaks were ruined, but they ended up tasting great – the black pepper offset the bleu cheese in a way that made the steaks rich, but not over the top. The char was perfect and the steaks were still a bit juicy, but they were badly over-cooked. Luckily my dear wife is very forgiving and enjoyed her meal. I’ll try these again, but next time I’ll dial down the heat to the 500°F range and flip them once a minute, checking the temp more often. She’s back in 10 days, maybe she’ll send home fresh salmon, and we’ll have surf and turf! 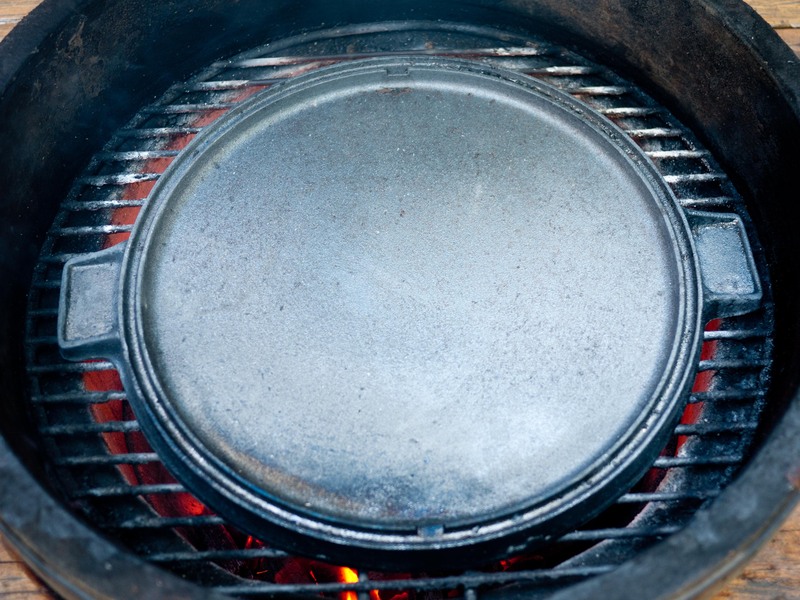 Dave — It appears you use a BGE. I too have one. My father has done steaks similar for 40-50 years on an outdoor fireplace. I copied his use of a simple steel plate on my egg. My believe, steel not as porous as the cast iron. Rock salt liberally sprinkled on the hot steel — then as much butter as you think you can stand. The salt will contain the butter some from running off a less than level grill. Then, yes, 2 minutes a side. The butter sears the meat and the salt give it a wonderful taste. If I knew how to post a picture I’d show you piece I had cut to fit on BGE. All the same —- your steaks look great! Thanks! I’ve seen a similar method with steel disks from a plow. I’ll have to try salt and buttering the pan next time. If those are “bungled” I’d still take that over most restaurant steaks, wouldn’t you? 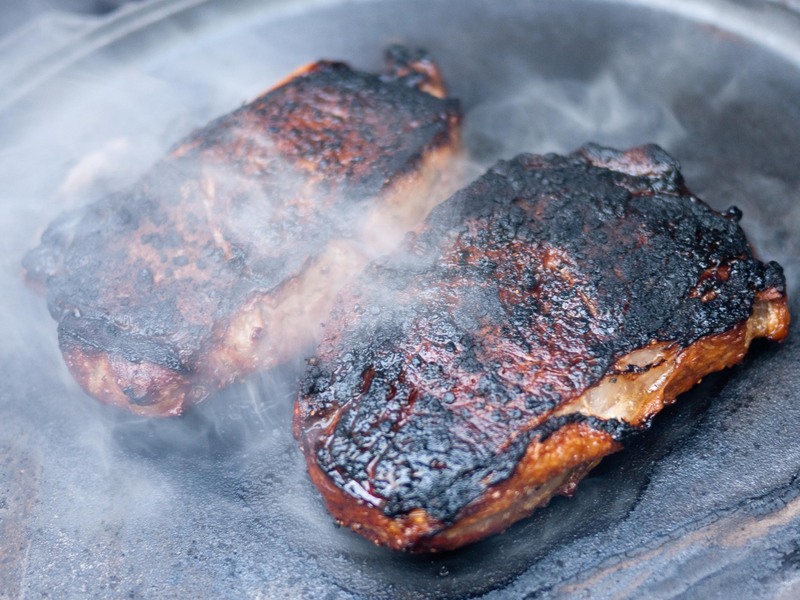 Nicely blackened steaks! Thanks – yeah they tasted great, now it’s just a matter of tinkering to get that lovely char and medium rare.